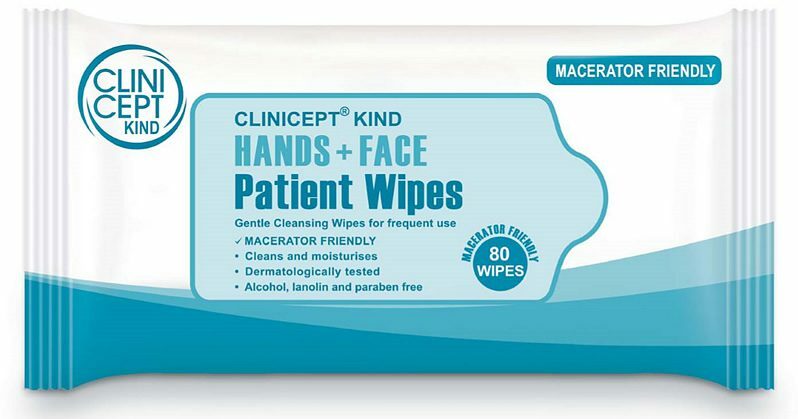 Our Clinicept Kind Macerator Friendly Hand and Face patient wipes have been specially formulated by UK skincare experts to provide a rinse free cleansing and moisturising action for the hands and face, all in one handy wipe. The wipes are kind and gentle to the skin. Dermalogically tested and macerator friendly. Our Hand and Face wipes can be heated in the warmer (or microwave) to aid the comfort of the patient, if required. These rinse free Hand and Face wipes are ideal for use in Hospitals, Nursing care homes, for home use for the sick or elderly and many other areas. Various pack sizes on the product are available, as shown below. We would like to hear about potential UK & International trade opportunities for Clinicept Kind Hand and Face (macerator friendly) wipes. If you are interested in distributing this product, please click here to contact us by email.